Have you ever used the Infrared marked cards? Do you still think these cards are safe? Maybe most people will say that these cards are good, because they cannot be tested by ultraviolet lights, and only infrared camera can check them out. Well, infrared marked cards are really good. However, more and more players are already familiar with them, have you realized that? What’s more, some players can even check these cards easily by simple methods, such as currency detector. Thus, the infrared marked cards are not the safest for you now. According to this situation, we have developed a new product, which is the new Fluorescent Marked Cards. Fluorescent marked cards are absolutely great. 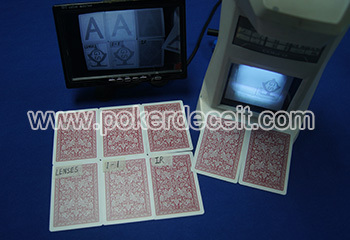 There is no technical can read them without our special camera which can work with the new fluorescent marked cards. 1. IR camera cannot detect. 3. UV lights cannot detect. 4. Only use our special camera to see the mark. 5. It is practical, easy to install the camera and easy handle.